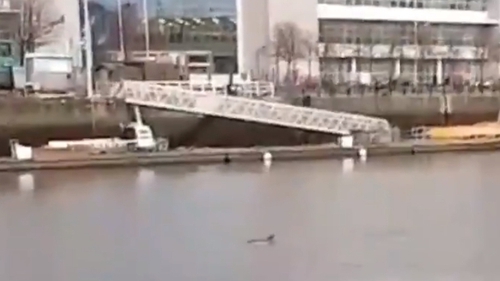 A dolphin has been spotted in the River Liffey in Dublin city centre. The Irish Whale and Dolphin Group says the animal, seen swimming between the Seán O'Casey and Samuel Beckett bridges, is a short-beaked common dolphin. It says the dolphin was swimming strongly and likely to have been feeding. An IWDG spokesperson said: "We've since received several calls from concerned members of the public asking whether anything should be done for it, and our reply is as always in these circumstances not to interfere. "If this dolphin is as the video suggests in good health and was able to swim upriver towards the city centre then it should be able to swim downriver on its own steam." IWDG marine mammal ecologist Clowie Russell is in the area monitoring the situation.